First, you must have Windows XP SP3, Windows Vista, Windows 7, or Windows 8 (32 or 64 bit). To check what version of Windows you are running go to “Start” then “Run” and type: winver and hit enter. On Windows 8 you need to go to “Start” and type “Control Panel” and then click the Control Panel app. Go to http://www.java.com and click the download button. Follow the instructions to install the latest Java. NOTE: The Java installer from Oracle will install a “Ask Toolbar” if you do not uncheck the option during install. If you have Java installed but not 1.7 or higher, you can proceed if you are using the Webstart download (it will prompt you to install the latest version of Java automatically). If you are planning to use the Archive download, you will need to download the latest Java as described above. You should have Java 7 (or later) installed now and you can proceed to download and run Praisenter. The Webstart download has the benefit of automatic updates (when an internet connection is available) and creation of a desktop shortcut/icon. It will also verify the version of Java you are running is up to date and will prompt you to download the latest if its not. 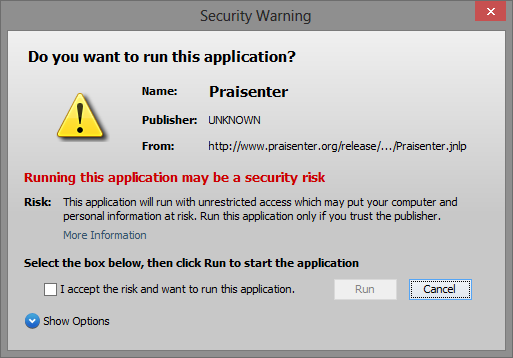 Check the “I accept the risk and want to run this application.” and click the “Run” button to continue. You can check the box “Always trust this publisher” under the “Show Options” so that you won’t be prompted for this again. If a desktop shortcut is not created you can create it manually by going to“Start”, then “Control Panel” (for Windows 8 type “Control Panel” and choose the Control Panel app), then “Java”. It may be called “Java (32-bit)” or “Java (64-bit)” depending on your system configuration. On the “General” tab click the “View…” button. Select the “Praisenter” entry and click the to create the short cut. Then close these windows. Whenever upgrading to a new version of Praisenter using Webstart you should clear the Webstart cache. The desktop shortcut may not be created if this is not done. To clear the Webstart cache go to “Start”, then “Control Panel” (for Windows 8 type “Control Panel” and choose the Control Panel app), then “Java”. It may be called “Java (32-bit)” or “Java (64-bit)” depending on your system configuration. On the “General” tab click the “View…” button. Select all “Praisenter” entries and click the to delete the cache, then close these windows. The Archive download does not require internet access to run. However, the archive does not perform automatic updates nor automatic Java version checking. Right click the Praisenter.zip file and choose “Extract All…” Then click “Extract” or “Next.” Then double click Launcher.jar.